October 21, 2013, WASHINGTON, DC – (PRNewswire/USNewswire) A novel study by the Asthma and Allergy Foundation of America (AAFA) published today in the Journal of Allergy and Clinical Immunology (JACI), finds that severe life-threatening allergic reactions – anaphylaxis – are common in the U.S. According to the peer-reviewed study, anaphylaxis very likely occurs in nearly 1-in-50 Americans (1.6%), and the rate is probably higher, close to 1-in-20 (5.1%). The article, Anaphylaxis in America: The Prevalence and Characteristics of Anaphylaxis in the United States, based on AAFA’s study of the same name, provides one of the most reliable estimates to-date of the prevalence of severe, life-threatening allergies in the general population. It is also helping experts understand how the public, patients and caregivers think, feel and behave regarding anaphylaxis. For the full text of the article, visit www.aafa.org/AnaphylaxisInAmerica. Dr. Robert Wood is the lead author of the article, chair of the AAFA research panel that conducted the study, and Director of Allergy & Immunology at Johns Hopkins Children’s Center. “This study provides the first estimate of anaphylaxis prevalence in the United States using a large unbiased survey,” according to the article. But the authors also pointed out that patients do not appear adequately equipped to deal with future episodes, indicating the need for public health initiatives to improve anaphylaxis recognition and treatment. Anaphylaxis is a severe, sudden allergic reaction that typically involves two or more organs, such as the skin, airways, lungs, stomach, heart or blood pressure. Reactions can be deadly. Anaphylaxis is most commonly triggered by allergies to foods, medications, insect bites/stings and latex. For others, exercise can be a trigger. Symptoms may include: difficulty breathing; rashes, hives or swelling of the lips, tongue or skin; vomiting; loss of blood pressure; or, even loss of consciousness. In the public survey portion of the study, the most common symptoms among those reporting anaphylaxis were respiratory symptoms (73%), followed by skin (61%), cardiovascular (24%), neurological (15%), and gastrointestinal (7%). The patient survey portion of the study had similar findings. More than 1-in-6 respondents (17%) who reported anaphylaxis also had a history of asthma, potentially putting them at higher risk for complications. There is no cure or preventative treatment for most causes of anaphylaxis, so immediate use of a prescription epinephrine auto-injector at the first sign of a severe allergic reaction is the standard-of-care for adults and children. Patients at-risk for anaphylaxis should be prescribed epinephrine auto-injectors to keep on-hand at all times and ready to use if an emergency occurs. But AAFA’s study showed alarming patterns of inaction: most patients are not getting these prescriptions, not keeping their auto-injectors nearby or not using them during allergic reactions when they should. Researchers found that only 11% of survey respondents who experienced anaphylaxis had used epinephrine, and only 10% called 911. Within this group 6.4% received no treatment at all, and 52% had never even received a prescription for an epinephrine auto-injector. In fact, 60% of respondents did not have an epinephrine auto-injector available to them at the time of the telephone survey. Since anaphylaxis is not a one-time event – a majority of respondents reported 2 or more anaphylactic reactions in their lifetime with 19% reporting 5 or more – researchers were even more alarmed about the lack of preparation among patients in the event of future reactions. Anaphylaxis can occur anywhere, and parents, teachers and neighbors can unexpectedly find themselves at the front-line dealing with this increasingly common condition. Even though the study found a majority of reactions occurred at home (54%), the overall lack of preparedness among patients in the study indicates that most won’t have emergency medication when needed, even in their own homes. Researchers also found that anaphylaxis occurred at the hospital or clinic (13%), at a relative or friend’s home (6.4%), in the workplace (6.1%), at a restaurant (6.1%) or at school (2.6%). Anaphylaxis in America is an independent research project of AAFA sponsored by Sanofi US. 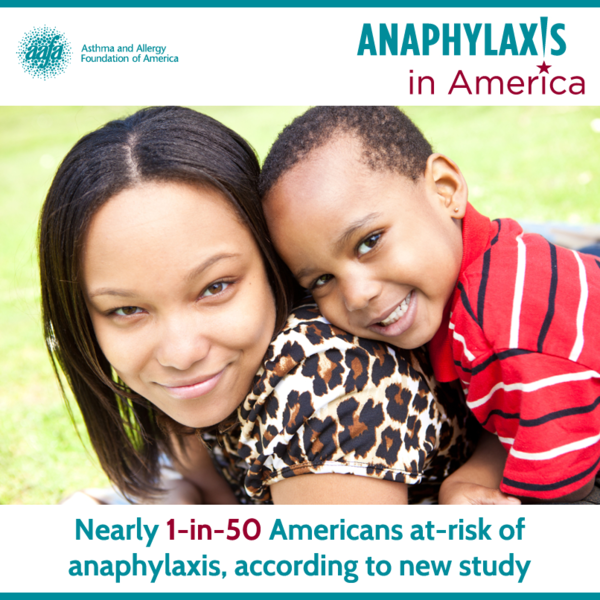 The study was designed by AAFA along with a leading group of health, medical and research experts to assess prevalence, as well as to better understand patient, public and caregiver attitudes and behaviors regarding anaphylaxis. Two independent nationwide, cross-sectional random-digit-dial (RDD) landline telephone surveys were conducted by the survey research firm Abt SRBI – a public survey and a patient survey. The study began in 2011 and was completed in 2012, resulting in over 500 pages of data, and researchers hope to publish additional findings in the coming year. For the public survey, 1,000 interviews were completed. For the patient survey, 1,059 interviews were completed. Household screening for the patient study was conducted to identify all persons with an eligible history of an allergic reaction and if more than one person was eligible, the respondent with a history of anaphylaxis or any reaction requiring immediate medical attention was chosen; otherwise he or she was chosen at random. If the person with a history of an allergic reaction was under 18 years, the parent or most knowledgeable adult completed the interview about the child. Data for the public survey was weighted by age and gender to be representative of the U.S. population. The Asthma and Allergy Foundation of America (AAFA) is a not-for-profit organization founded in 1953 and celebrates its 60th anniversary this year. AAFA is the leading patient organization for people with asthma, allergies and related conditions, and provides practical information, community based services and support through a national network of chapters and support groups. AAFA develops health education, organizes state and national advocacy efforts and funds research to find better treatments and cures. Learn more about AAFA and the study at www.aafa.org/AnaphylaxisInAmerica. EDITOR’S NOTE: Please see the article for additional information, including other authors, author contributions and affiliations, financial disclosures, funding and support, etc. The Journal of Allergy and Clinical Immunology (JACI), an official scientific journal of the American Academy of Allergy, Asthma & Immunology (AAAAI), is the most-cited journal in the field of allergy and clinical immunology.